Not much love for DDL? Maybe it was a bum question. 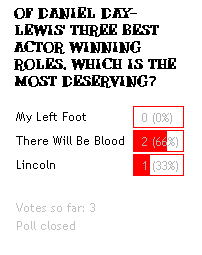 Anyway, thanks to the 3 voters, the majority of whom love their Daniel Plainview. Who's your favorite Irish actor?